I used to think my life was made up of a long series of mistakes. Staying in an abusive relationship for nine years, which put me in the hospital at one point – that was a big mistake. Starting and failing to finish many writing projects – including never getting back to a producer who was eager to read my next screenplay -that was a big mistake. Spending $50,000 to get a Master’s degree in Education, teaching for five years while dreading it most of the time, and now having to pay back a large loan – that was a big mistake. It was hard not to play the what if game. What if I had made different choices? What if my life would have been different? But when I started answering those questions, I came to some surprising conclusions. If I hadn’t been in that abusive relationship for as long as I was, I wouldn’t have met my husband at the time when I was most ready to meet him. I would not have valued and treasured him as much as I do. If I hadn’t started and failed to complete my writing projects, I wouldn’t have come to realize the importance (for me at least) of forming strong, writing habits, of focusing on projects I care about, and helping others reach their own dreams. If I hadn’t spent an insane amount of money on a teaching degree, I wouldn’t feel so passionately about my children only going to college if they truly need that degree to help them reach their goals. If I hadn’t taught in private and public schools, I wouldn’t have seen the importance and necessity of children following their own interests in learning and doing real, meaningful work. I’m still wandering and making mistakes. They’re mistakes in that they weren’t the path that I first started off on. In many ways, they may lead me so far off my original path that I may never find myself back on the same path again. But to make mistakes is to take action. You can sit down on the path and not move your whole life. You might even have a comfortable time sitting on the path, watching others walk past you, content that you know exactly what’s in front of you and don’t have to be afraid of what’s around the corner. But is that what you really want? To stay in the same place because you’re afraid of making mistakes? Afraid of what could go wrong? I used to think that by protecting my kids from making mistakes, I was helping them see the “right” way to do things. I was providing them a short-cut so they wouldn’t have to take so many wasteful detours. But I’m learning that those detours are really part of the path they should be taking. When I don’t allow them to make mistakes, I’m taking them away from the journey they were meant to take. Instead I’ll be here for support whenever they need it; I’ll do my best to protect them from permanent harm. I’ll help them figure out the best tools they need for their journey; I’ll model how to reflect, learn from and grow stronger because of mistakes. 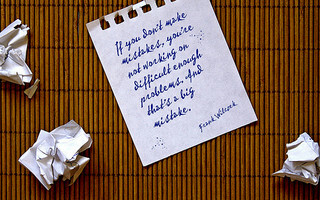 How have your mistakes helped shape who you are today? I have made SO.MANY.MISTAKES in my past! I do know that I am who I am because of them, and I believe mistakes are ok as long as we learn from them. I was not in an physically abusive relationship, but I have been in some bad ones. I can totally identify with what you said about your education and how it makes you feel about your kids going to college…I feel the same way. Thanks! For me, learning from my mistakes is usually the hardest part. It seems like it takes a long time, years usually, before I can really understand what I was supposed to learn. When my kids make mistakes, it’s hard not to jump in and tell them right then and there what the lesson is they should be learning! But how do I even know what it is they are supposed to be learning anyway? I so agree that it is the mistakes we make that lead us to where we belong. I have learned this too. I know mistakes are necessary but it is oh so hard to watch Keilee make them without wanting to run in and ‘fix’ every thing. I am learning. Great post Chris. Thanks! I guess it’s a mommy thing to want to jump in and protect our kids, isn’t it? I usually write posts for me, to remind myself when I’m not in the thick of things what I really believe and value. So hard in the moment though! great article, Christina. I too was in an abusive relationship mostly because of plain disobedience. I realized after asking “why?’ so many times that some lessons are not learned unless we make mistakes. I learned that it was a “necessary” mistake. Like you, I learned to value my husband and actually see and receive him as a gift from the Lord because of the mistake I made previously. I remind my children daily that mistakes are part of life; that we learn when we make mistakes. Specially when we are doing Math I tell my DD9 that the correct answer is not as important as the thinking process and understanding. If she has those 2 in place, then the correct answer will show up. I love the verse from Romans 8:28 it summarizes making mistakes in a beautiful way. Thanks for the reminder! I loved the book The Purpose Driven Life. I’ve recieved so many blessings from God out of the mistakes I’ve made in the past. Almost makes me feel a little guilty about it sometimes. Great, great, great post. Did I mention it was great? I don’t think there are any mistakes, because I think any choice we make leads us to something else. And we learn from those things. And they bring us to where we are meant to be…and I think you’ve made that clear in your post. I also was of the impression a long time ago that sheilding my children from mistakes was the right thing to do, but now I realize it makes their life false and fake and makes them miss out on the real learning that can only happen from making mistakes. Thanks for this post!! You’re very, very welcome I think that when we shield our children early in life, it makes it that much harder for them to learn the same lesson when they’re older. It’s like we’re taking away something important for their development at times. It’s just so hard to watch those you love be in pain sometimes, even when that pain is ultimately making them a stronger person.